Cycling and active transportation will take a big step forward with the announcement on December 4 of provincial funding for Renfrew County, Lanark County, and eight local municipalities through the Ontario Municipal Commuter Cycling (OMCC) program. The County of Renfrew took the lead in coordinating a joint application with seven municipalities in the County, with most of the funding intended for use in developing the former CP Rail line, known in Renfrew County as the Algonquin Trail. "We are truly delighted with this news," said Ottawa Valley Cycling and Active Transportation Alliance (OVCATA) Co-chair Ish Theilheimer, who approached Renfrew County Council on March 29 along with OVCATA's secretary Ron Moss. "We told the Councillors about the program that day, and they went right to work on taking advantage of it, pulling together a joint application, which is never easy. Their efforts will bear a lot of fruit." The County of Renfrew applied for the OMCC funding and included a funding request jointly and on behalf of the seven municipal partners for a complex, multi-year commuter cycling program involving the Algonquin Trail. The program is intended to create commuter cycling links between rural and urban areas like Arnprior, Renfrew, Petawawa and Pembroke. OVCATA is collaborating with Discovery Routes Trails Organization, which is based in North Bay, to connect the Voyageur Cycling Route, which crosses Canada from west to east and currently extends as far east as Mattawa, to Ottawa, tracking through Renfrew and Lanark County. "We are thrilled that the Ottawa Valley Rail Trail Committee recognizes the opportunity that the trail provides for a variety of users and has considered cyclists as primary users of the facility," said Jennifer McCourt, of Discovery Routes. "Planning a route that is safe and convenient for cyclists is a top priority in the development of the Voyageur Cycling Route. The announcement of the funding supporting cycling infrastructure makes sections of the rail trail a viable option for the Voyageur Cycling Route." The biggest obstacle to this has been the stretch of Highway 17 between Mattawa and Petawawa. Provincial officials and cycling advocates like Discovery Routes and OVCATA have been discussing whether the Algonquin Trail could be surfaced to accommodate cycle traffic, which would resolve major safety and traffic concerns from having cyclists on Highway 17 and also boost tourist business in all the towns along the line. Discovery Routes is conducting a feasibility study to determine best routes thru Renfrew County, which might include some other sections of the Algonquin Trail. "Trails like the Algonquin Trail have played important roles in revitalizing small towns in many parts of Canada and the U.S.," said Theilheimer. "And they can also play an important role linking our local communities and getting more people onto bikes and more cars off the road." - paving 17.3-km of shoulders on both sides of County Road 43 between Perth and Smiths Falls. "All of these projects have the potential to entice commuters to embrace cycling to work," said Lanark County CAO Kurt Greaves. "OMCC is an opportunity for Lanark County to see some of the carbon tax funds reinvested for the benefit of our community." Across Ontario, 120 municipalities will receive funding from the province for new bike lanes and other cycling infrastructure. Total program funding is $93 million, an increase from the $42.5 million announced earlier this year. This investment is part of Ontario's Climate Change Action Plan and is funded by proceeds from the province's cap on pollution and carbon market. Locally, Renfrew County received $372,360, Lanark County got $548,290, Petawawa received $90,771 and Admaston Bromley, Arnprior, Greater Madawaska , Laurentian Hills, Laurentian Valley, Pembroke, Renfrew, Whitewater Region, and Mississippi Mills each got $25,000. 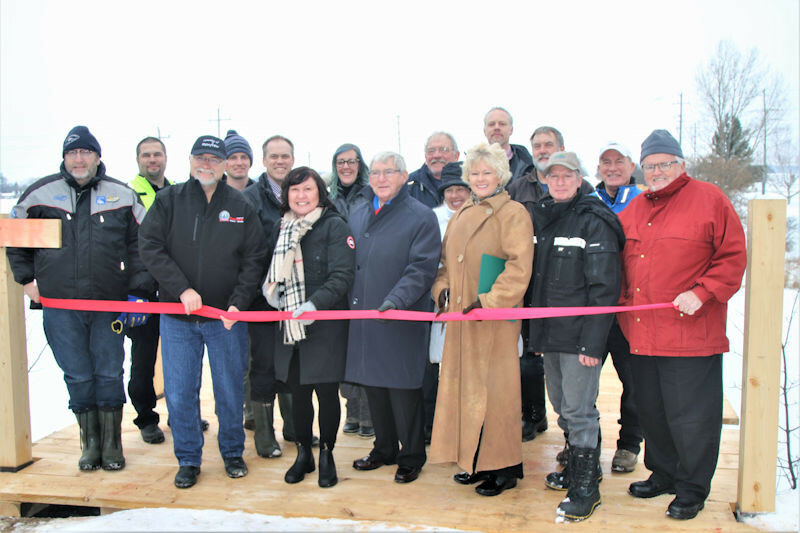 Front row: Peter Emon, Renfrew Reve; Jennifer Murphy, Renfrew County Warden; Bob Sweet, Renfrew County chair of the development and property committee; Cheryl Gallant, MP for Renfrew-Nipissing-Pembroke, Greg Tatan Renfrew County ATV Club, Walter Stack, Arnprior Reeve. Back row: Terry Vaudry, Snow Country Snowmobile Region Club; Steve Osipenko, acting commander with County of Renfrew Paramedic Service; Anthony Hobbs, Forestry and Trails Technician with the County of Renfrew; Craig Kelly, director of development and property for the County of Renfrew; Melissa Marquardt, Marketing Coordinator with the Ottawa Valley Tourist Association; Bill Jamieson, Sno Goers Snowmobile Club; Jason Davis, County of Renfrew Forestry and Trails manager; Debbie Fiebig, Treasurer of Ottawa Valley Cycling Active Transportation Alliance (OVCATA); Jim Inglis Whitewater Sno Goers; Ron Moss, Secretary of OVCATA.